W3 Ultrasonics and Cleaning Equipment Systems - What Is Surround Cleaning? Surround is the term to describe a whole new approach to industrial cleaning using high power ultrasonics as the primary cleaning action. Surround is also the name of a new class of products based on the surround concept. Essentially, surround cleaning is just as the name implies. The part(s) are surrounded by high power ultrasonics driving from sides, bottom and even from the top in certain configurations. You might say it is "cleaning in the round". It's not that cleaning with round tanks has never been done before. It has. But being able to focus ultrasonic power from all sides this way has not been achieved. Ultrasonic power starts out at the transducer as unidirectional with maximum cavitation action occurring at the part exposed directly in front of the transducer's radiating surface. We refer to that as primary cavitation energy. 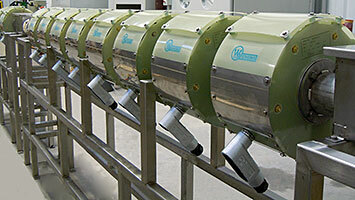 The more powerful the sound wave in the solution, the more cavitation energy released. Reflection and other disbursement of a high energy sound wave can effectively cause ultrasonic power to become omni-directional resulting in good cleaning in other areas of the bath. We refer to that as secondary cavitation energy. Therefore, know the above, and having the desire to produce an extremely effective ultrasonic cleaning method, we developed the Surround concept. We start with intentionally designing the highest power ultrasonics to produce the highest primary and secondary cavitation energy. 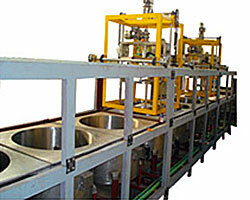 We house that into cylindrical vessels to maximize its effectiveness. Then add a wide range of sizes and shapes for practical uses; and you have the driving principals of the exclusive W3 Surround technology. W3 personnel have over 100 combined man years of experience in this field. 40 years experience in design, build, application of highest power ultrasonic equipment - magnetostrictive design. Unique capability to bond transducer elements on curved surfaces. Surround products start with W3 cylindrical transducers shown here. 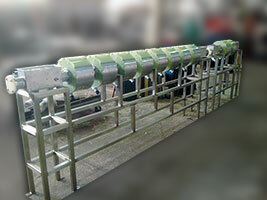 Initially this style transducer was used to clean wire products in line at high speed. The systems were later expanded to strip, rod, conduit and other in line product applications and then into a broader line of cylindrical transducers to enable the same principal as the wire cleaning to conveyorized products. W3 development of even larger diameter transducers has evolved into the Surround products. They continue to surround the product with ultrasonic sound waves and cavitation activity. The Surround product family now includes a line of tanks which function as conventional square or rectangular ultrasonic tanks except the cleaning effect of cavitation does indeed come from the sides and even from the bottom depending on the configuration. Surround products now allow us to consider applications in a different manner when you have the ability of applying cleaning cavitation action from many sides of the part. Here are some application examples that can now be considered differently than before. Part loads can be exposed to more ultrasonic scrubbing action at one time decreasing cleaning time and increasing productivity. Loads requiring rotation about one, or more, axis to provide coverage of cleaning action whether spray, agitation or ultrasonics can now be considered without rotation reducing initial capital cost. Nested parts where the depth of the parts is limited by penetration from top spray or bottom ultrasonics or violent load agitation can now be loaded deeper and therefore greater part load per cycle increasing product throughput. Delicate products where long time exposure to any cleaning action may harm exposed parts. Cavitation action from multiple sides reduces part masking or shadowing allowing faster and more thorough cleaning with no part damage. To see just how Surround Products can apply to your application and enhance your cleaning results and increase productivity, contact W3.